Dreary days like today put me instantly in the mood to watch the 1980 Stanley Kubrick interpretation of The Shining. In the first place, there is something endlessly fascinating about a writer's descent into madness, and not just because I can sit and say, "well, at least I'm not as crazy as that guy." (I feel this way about the movie Secret Window, as well -- there is an unexplainable comfort in watching a writer go insane.) But I adore Jack Torrance's dark spiral into insanity, until he finally realizes the Overlook Hotel owns his soul, he was drawn to the place because it was in fact pulling him there. Meanwhile, the dangerous connection his father has to this enormous hotel with a spotted past is the very thing that drives Danny, his son, mad, as he suffers visions of the murder and violence that mars the halls of the place. His "Shining," the brain power that allows him to see events past, present, and future, warns him -- often and vividly -- that his father has a dangerous connection to the place, and that they should not be there. Jack inevitably tries to kill them both, in an effort to stop them from ruining his own relationship with the hotel, and dies trying. It's a story about what happens to your brain when you're in solitary confinement, or under the influence of alcohol, or a lack of it. He's a troubled alcoholic, with a troubled family life, and all that comes into fine clarity when the three are all alone, together, to mull over their troubles for months and months of solitude among the snowy peaks of Colorado. Much more simply, it's a haunted house story, and those have always been my particular favorite. Haunted house plus insane writer, set against a snowed-in hotel with iconic architecture and design details, and I'm sold. But add to that Kubrick's flair for the bold, the terrifying musical score, and the many unresolved questions you're left with at the end, and it's absolutely one of my most favorite films of all time. The scariest of horror films to me are the ones that leave some things impossibly unexplained. In other words, there can be no logical answer to resolution anyway, and so you are left pondering the events and the story long after the credits roll. You and your imagination. The Shining does this. I've seen this movie probably fifty times, and I still find myself trying to figure it all out, only to decide that it can't be done. Why this, or what was that supposed to symbolize? It doesn't matter -- it's horror, it's in your mind, it's psychological thriller at its very best. And Stephen King wrote it during his darkest bought as an alcoholic himself. He remarks in his memoir how strange it is that he wrote the entire story of Jack Torrance without realizing that he was writing about himself. Darkness, indeed. *Update: In August 2013 I actually wasted two hours of my life watching a documentary called Room 237, in which a bunch of conspiracy theorists with "credentials" explain all the meaning they believe is contained within this film. Watch it only if you want to hear some truly crazy theories. Beyond the amazing story, the imagery of this movie is absolutely classic. 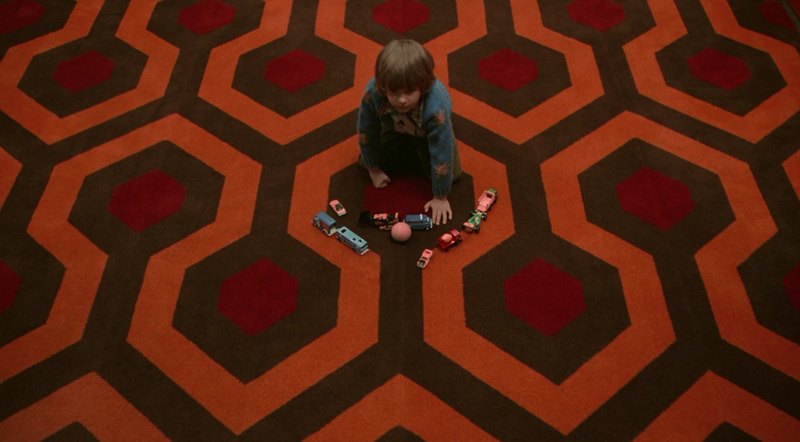 It makes me want to design my own home all around the theme of Kubrick's Overlook Hotel. I adore the wardrobe decisions, I am obsessed with Shelley Duval's style and facial expressions: it would not be The Shining without that horrified face and dopy sweater combos. I love the American Western and Native American motif influences throughout the entire hotel: the carpets and tile flooring, the furniture, the paintings and wall hangings and the antlers throughout. I've heard before that Stephen King hated this 1980 interpretation of his book. I don't know if that's true. But I sure cannot get behind the 1990s-era miniseries that came out, supposedly a more accurate interpretation of the original story. It's the iconic setting, this amazing hotel they found as the backdrop, it's the musical score, it's those actors, that make the whole thing so incredible. I cannot imagine anyone besides Jack Nicholson as Jack Torrance. I've read The Shining, as an audiobook, and it's incredible too - definitely worth reading it you're into horror or thrillers or are a writer yourself. The mysterious happenings are much richer, and it helps you understand more about the film, and is scary and amazing as once. The ending in the book is far more satisfying and provides more answers and better closure than that of Kubrick's film. But to me, these two works of genius stand alone from one another, and cannot be compared directly. They are a package set. And on days like today, I want to dive into both. But it's that breathtaking imagery, and those spell-binding characters -- the hotel and landscape themselves characters in this story -- that I crave most. It's a movie I find myself truly watching each time it's on, not simply playing in the background. It's an entire experience, and it's kind of weird how often I can sit down and lose myself in all these magnificent components of film at its very best. I watched it just a few days ago, when I grabbed these screen shots, and I am really itching to watch it again now, writing all this down. Maybe I'll listen to the audiobook again.